Inbound Marketing, is synonymous with the concept of permission marketing, term coined by Seth Godin. It is also loosely interchangeable with content marketing. But whereas content marketing includes offline content, such as custom magazines and conferences, inbound marketing is 100% web-based. But before we delve into the details of inbound marketing, let’s get into the why. With 14.3 trillion web pages available, the media monopoly has been broken. The traditional “interruption marketing” of the last century no longer works. Now our customers and prospects look to achieve their own goals, not the goals of a monolithic media monopoly. They use the web as their personal library, encyclopedia and research database all rolled into one. Inbound marketing takes advantage of this dynamic by tapping into what our customers are naturally looking for on the web: high quality content. Inbound marketing uses this to pull them into a value-laden marketing process. 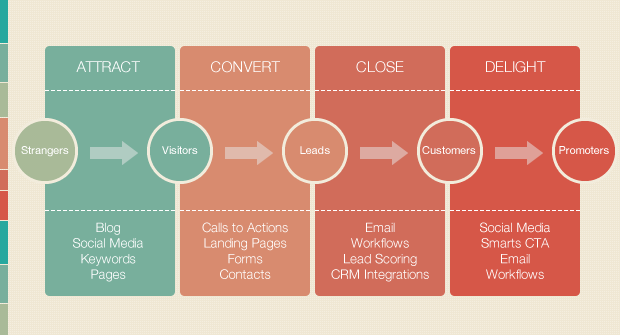 Hubspot breaks down the inbound marketing process into four stages: attract, convert, close and delight. This closely mirrors Duct Tape Marketing’s Marketing Hourglass. You take customers from know, to like and to trust. You convince them to try out your product or service and then buy from you. Finally, you provide such excellent service they become repeat customers and finally become brand supporters and start to refer customers to you. Customers who are browsing the web are there to get answers to questions. How do I bake an apple pie? Where can I take my child to the specialist? How can I become a better father? We anticipate these questions and provide answers to their questions by way of blog posts, our web pages, optimizing our content to the keywords that our customers are typing into Google/Bing/Yahoo, and providing pay-per-click ads with those same keywords. When we answer our customers’ questions, we satisfy their mission when they went on to the web. They are looking for answers, and we give them answers. When we answer questions, we also begin having a conversation with our customers. Janice (Ginny) Redish, in her book Letting Go of the Words, talks about how our web pages need to be part of a conversation with our website visitors. Our web pages should not be filing cabinets. Every word on every page should be part of a conversation our customer is already having in her head. We do the same thing on social media, but this time the conversation is real. We do this through our blog, our videos and our podcasts as well. This is where we start interacting with our customers, getting them to like us and to trust us. The conversation helps us understand them, and helps them understand us. It also leads us into a deeper engagement with our customers. By convincing our customers to subscribe to our newsletters, become members of our “members-only” websites, follow-us on social media, or call us, we establish a deeper engagement with our customers. This is the point where they start to trust us and believe that we are looking out for their best interests. They become our fans, start to share our content, and start to look for ways to start a commercial relationship with us. Saying that our customers become buyers is to minimize this part of the inbound marketing process. Our customers enter into a commercial relationship with us by purchasing our product or contracting our services. But this is where the relationship begins. We use tools such as CRM, surveys, customer newsletters and customer appreciation gestures to turn them into regular buyers of our products or services instead of one-time buyers. We also want to turn them into advocates. 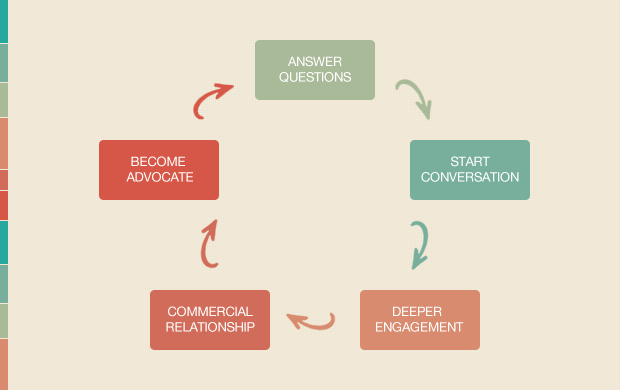 By delighting our customers, as HubSpot describes, we turn our customers into advocates. This is when they refer us to their friends and family. We help them by establishing formal processes that enable them to do that while gaining a reward for doing this. We also continue to provide value by providing them with educational content that helps them get the most out of our product or service. We use our newsletters, social media, blog, events and webinars to provide more value to our customers, and help them become advocates for our services with their network. The tools of inbound marketing overlap with the tools of online marketing and content marketing. We will discuss how blogs are a common entry point for your prospects: you can answer their questions, start the conversation, and drive a deeper relationship by gently leading them to subscribe to your email newsletter. We will discuss how Social Media is where many conversations start, and how you can use social media to start answering your prospects’ questions, and leverage those conversations into a deeper relationship. When they are ready to let us into their inner sanctum (their inbox) and have a deeper, more engaging relationship with them, we’re ready with our email newsletters. This is where we drive that deeper engagement by providing them with more of the content that answers their questions and deepens the trust. Our landing pages serve to move the relationship from one stage to the other. We often use landing pages to answer questions and start conversations by offering special reports or free eBooks for download. We encourage them to subscribe to our newsletters. Finally, we use landing pages to start the commercial relationship. Are you ready for the world of inbound marketing? Inbound marketing requires a change of mindset. We need to recognize that our customers’ behavior has changed. They no longer have to sit through an interruption and listen to or read a commercial. They are purposefully looking to answers to their fundamental life questions. When we recognize that, and realize that by answering their questions we can attract them and star the inbound marketing process, we are already halfway there.